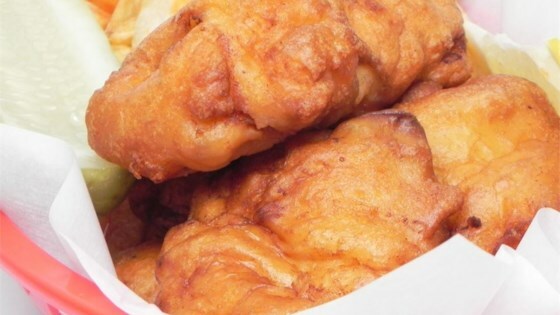 "Good tasting, simple recipe for New England's favorite dish fish and chips. Serve with malt vinegar, lemon, or tartar sauce." To those all mentioning the soggy fish effect: Whatever liquid you use, be it water, beer, etc., it must be ICE COLD. That keeps the batter light & cooked fish will not get soggy. Batter stayed on the fish well and crisped up nicely. The flavor was fine, but was missing something. Next time I'll add half milk and half beer. Other than that, this is a great recipe!